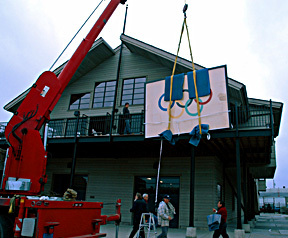 Olympic flag lifted over the balcony of the CAL Crew boathouse. Installation by Atthowe Fine Art Services. Atthowe Fine Art Services: A full-service company specializing in the safe handling, shipping and installation of large, fragile and valuable fine art. Connect Art International: Quality fine art services in California and worldwide. Farber Art Services: Quality fine art installation. Lawrence Fine Art Services: High-end transportation, crating, storage and installation for art and antiques. Navis Pack & Ship: Navis specializes in packing, crating, and shipping of all types of art worldwide. Shipart International: Climate controled shipping. AIC Guidelines for Selecting a Conservator: points to keep in mind when choosing a conservator. Barbara Markoff, Corporate Art Consultation, San Diego area . Richard Holgate, B. Sc., ISA • Personal Property Appraiser • Estate, Fine Art & Antiues, Insurance, Valuation, Authenticity/Collections/Damage Claim Inventory. 805-895-5121.